Keep the muscle, lose the fat. If you’re dreaming of building a lean, ripped physique, you could achieve it sooner by taking a quality supplement like Body Perfect® CLA 500. Our easy to swallow capsules are designed to aid weight loss and improve lean muscle definition by encouraging your body to use existing fat for energy. Backed by many conclusive scientific studies, CLA has become one of the world’s most popular slimming aids. These studies also explain that taking in the optimal levels of CLA cannot be done naturally through food. This means it’s necessary take a CLA supplement to gain its benefits. 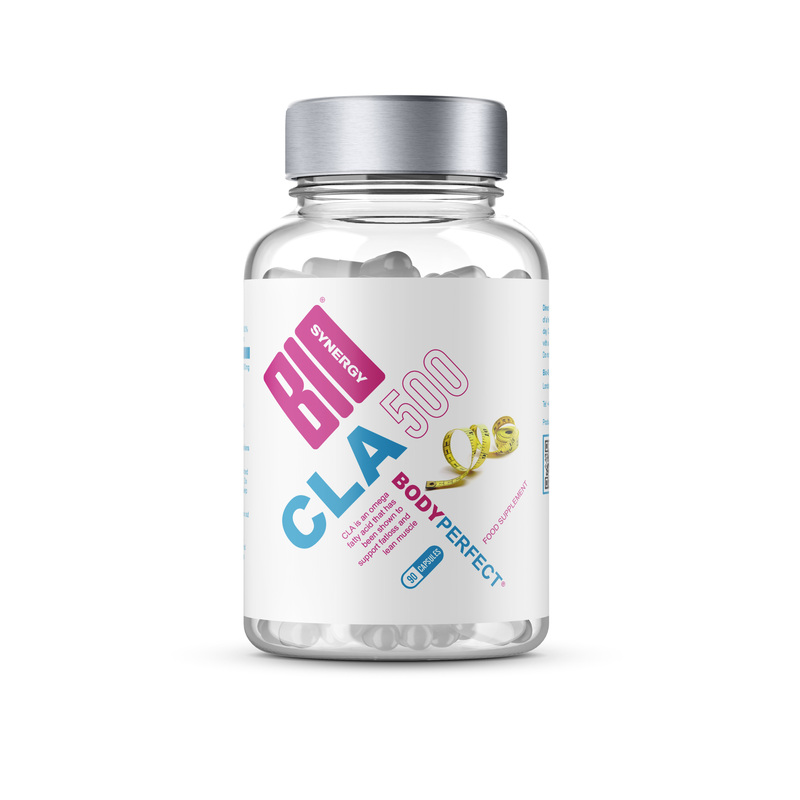 Body Perfect® CLA 500 from Bio-Synergy provides a massive 500mg of actual CLA per serving. Our formula is designed to promote weight loss and improve lean muscle definition by encouraging your body to use existing fat for energy. CLA (Conjugated Linoleic Acid) is a fatty acid mix from omega 6 that occurs naturally in meat and dairy sources. But, they’re in relatively small amounts in these foods. So, you would have to eat many platefuls to achieve the same quantity of CLA that’s in our capsules. Save on calories and money by using a supplement like Body Perfect® CLA 500 from Bio-Synergy. Numerous studies from around the world have shown that CLA can help you lose fat and build muscle. A Norwegian human study found that CLA-supplemented subjects lost up to 20% body fat in three months without changing their diet, while the control subjects gained a slight amount of body fat during the same period. CLA is a naturally occurring fatty acid found in foods such as cheese, milk, lamb and beef. But, these are all in relatively small amounts, meaning that it’s necessary to add a supplement to your diet to achieve the benefits of CLA. IS BODY PERFECT® CLA RIGHT FOR YOU? If you’re looking to achieve a toned, ripped physique, then yes, it is. Our easy to take capsules are suitable for both men and women and, as they’re stimulant free, can easily be used along our other supplements to help you torch more body fat. We’ve got you covered with a wide range of other weight loss products: Bio Synergy Thermogen, Creatine Plus®, Activeman Thermolean®, Whey Better®, Diet Whey®, and Vegan Lean&Green®. As with all our products, Body Perfect® CLA 500 is made from the highest quality, naturally occurring fatty acids. What’s more, Body Perfect® CLA 500 is manufactured in our own UK-based facilities by an expert team of scientists. That’s how we ensure all our products are made to the same high standards. Conjugated Linoleic Acid (80% Active Isomers), Gelatin, Glycerol, Water. For optimum results, take 3-6 capsules per day with water and before food.